I’ve been wanting to do this for a while now. But I’ve been too scared. Or maybe I enjoy going to the grocery store too much. Something about lollygagging my way down aisles of pickles, dried fruit, crackers (seriously though, why do we need an entire aisle of every single cracker known to man?! ), browsing the shelves for the latest “natural” cereals and granola bars. Grocery shopping relaxes me. Apparently I’ve needed a lot of relaxation recently, because our grocery bill has crept up and up over the last few weeks. Part of this is the fact that I was on break last week. Whenever I have a few days off from school, I say to myself, “Ooooh, now I can make this soup and this chicken dish and try this muffin recipe and make my own granola bars too! And I’ll post them all on my blog because I CAN!” The result? A very full refrigerator, a happy husband, and an exploding facebook newsfeed. Oh, and a ton of dishes in the sink and a very large pile of receipts sitting on my kitchen counter. Oops. Yes, this is a scary thought to me. And yes, I think it will be harder than I think. And I think it will be hard. 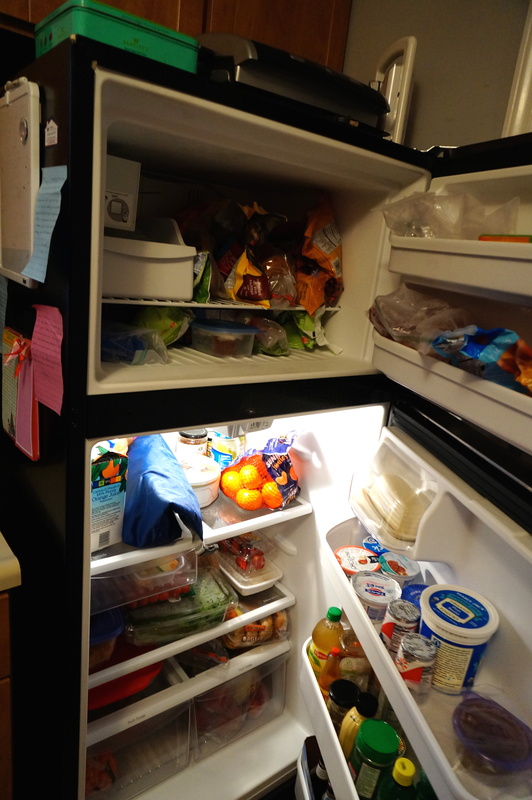 Let’s look at what we’re starting with… here is my refrigerator and freezer in “real-time”- today, April 28th, 2014. This day will now go down in history. Ok, maybe a bit dramatic. Anyhoooo, here it is. Freezer stocked with a few bags of frozen veggies- about a third bag of corn, quarter bag of broccoli, one leftover lentil dahl burger, a bag of frozen chicken breasts, frozen fruit, some freezer-ready meals from TJ’s, and two frozen carrot cake cupcakes that we never finished at Easter. On the fridge front, from top left to bottom right, we’ve got some OJ, 1% milk, my lunch bag for tomorrow, leftover muffins, salsa, pickles, clementines, some deli turkey, baby spinach, leftover pork and ham, red grapes, strawberries, leftover smashed potatoes (also from Easter) and enchiladas, sweet potato fritters, leftover succotash, leftover chickpea and lentil salad from Indian food night, some whole wheat pita pockets, sandwich bread, an almost-full carton of brown eggs, a few (probably stale) bagels, and in the bottom drawers some raw veggies (carrots/broccoli/tomatoes/parsley) and fruit (apples, oranges, and a pear). In the side doors are butter, some yogurts, various sauces and mustards, some homemade balsamic, a leftover pie crust (quiche, anyone? ), cheese, and adult beverages. The pantry (not shown) is stocked with some canned beans, pasta, cereal, crackers, and odds and ends of chips, lunchbox snacks, and dried fruit/nuts. Also one yellow onion and one sweet potato. I’m probably forgetting a few things but will edit this post later in the week if I use something that I neglected! Not a bad starting line-up. When I see it on paper the computer screen, it honestly seems like a lot of food, and I wonder why I would ever decide I needed to go to the store for more. 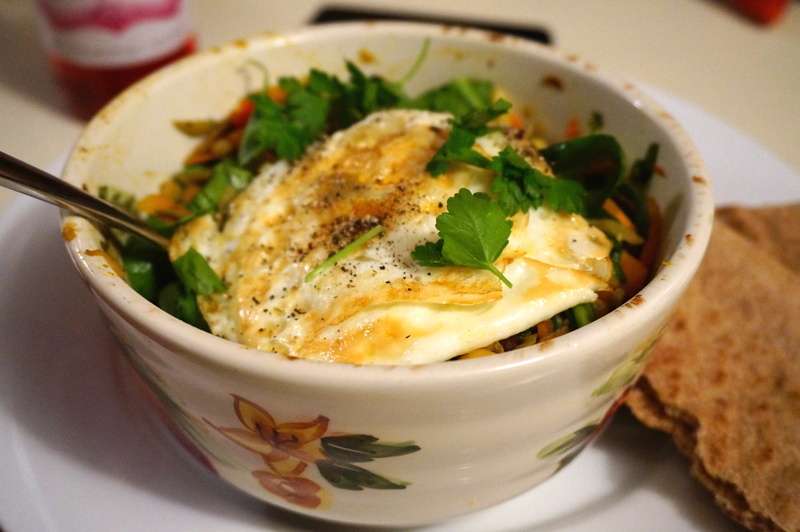 It’s humbling to write down all of the foods that we already have on hand, and convicting to expose my seemingly- insatiable desire for “more” that too often I just ascribe to my creative ‘cooking juices.’ Not only will this week’s challenge help me to “spring clean” my refrigerator, but it will hopefully also help me to overhaul my outlook on materialism as it relates to food. However, I couldn’t start this challenge without being brutally honest. There are a few things that honestly, we can’t really go without buying mid-week. Whether this is due to our my own food addictions preferences or simply the fact that they go bad so quickly, I will let you decide. For this, I decided to allow five exceptions to the rule. Three of them I can name right now: apples (because I don’t have enough on hand to last me through the week, and yes, I still have an apple every single night after dinner), bananas (Ben and I both grab a banana pretty much every morning for breakfast and they go bad so.dang.quick), and spinach (because I couldn’t very well turn all of those leftovers in our fridge into a salad without some leafy greens, right?). The other two exceptions I’ll decide later, but I imagine they will probably be something in the produce arena. So what did I decide to make for Day #1 supper? 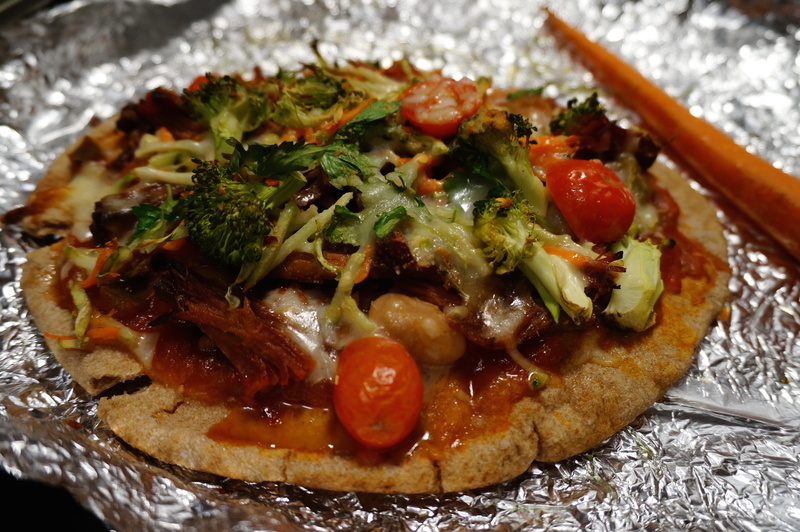 What better way to stretch leftovers in a creative way but with pita pocket pizzas! Ta-da! 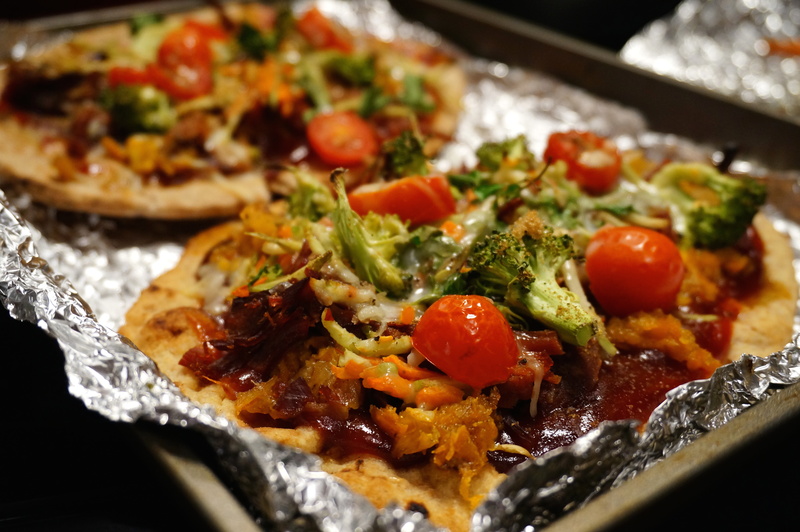 I used up some pita bread and one leftover slice of naan to make these personal pizzas. Two of them I topped with a mixture of BBQ sauce and ketchup, followed by some of the leftover pineapple ham, broccoli slaw, broccoli florets, cherry tomatoes, mozzarella cheese, and a sprinkling of cumin, brown sugar, fresh parsley, and shredded mozzarella. The last pizza I topped with salsa, and all of the other ingredients remained the same. Popped ’em in the oven at 325 for about 20 minutes, and out they came, all toasty. Delish! Stay tuned to find out what I’ll dream up for tomorrow’s edition of “Spring Clean Your Fridge” Challenge!